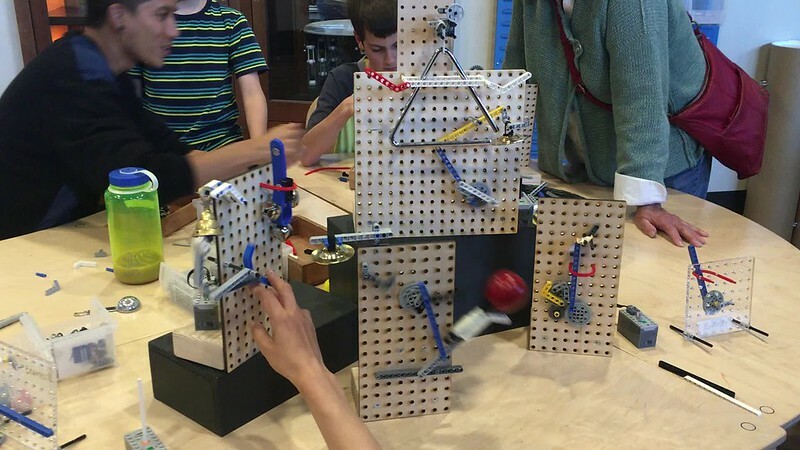 As we experiment with LEGO parts to explore with motions, mechanisms and linkages, we've also been working on custom elements to help us and visitors with the process of tinkering with these materials. Early on, Sebastian created a Illustrator file for a pegboard pattern with holes that have the right size and spacing for LEGO technic pins and beams. 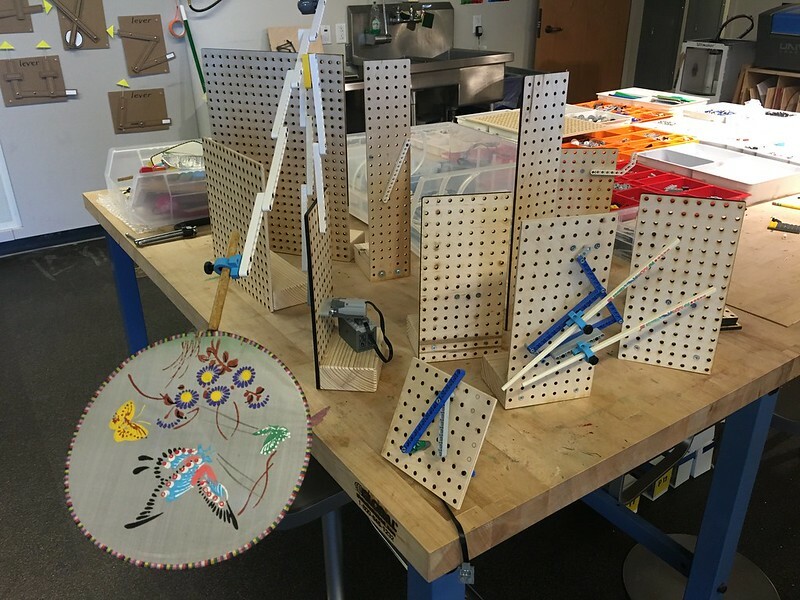 We originally cut the pattern out of clear acrylic, but Nicole adjusted the design to create personal-sized wooden pegboards for learners to use to create linkage machines. We liked how the transparent acrylic allows people to see what others are working on around the table, but something about the smaller wood pegboards lent a friendly element to the experience. 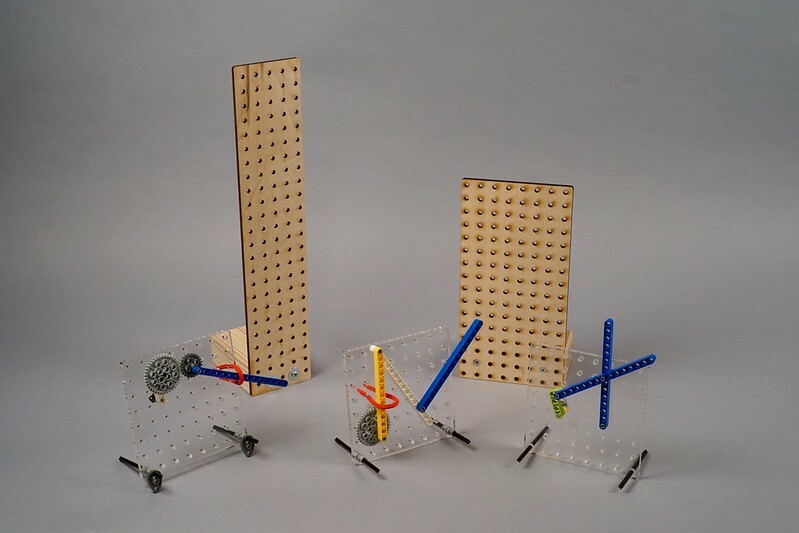 We've liked using these bases for building surfaces for linkage sound machines and robot arms experiments and we've seen a bit of the potential for others to take the idea further over social media using #LEGOtinkering hashtag. We've had a bunch of requests to share the file for the pegboard, so Sebastian and I took some photos and wrote up a quick instructable for the project. Hopefully others will take the lasercutter file and basic instructions further and customize the design to fit their own needs. It's been great to see all of the different ideas that collaborators near and far have been prototyping and we're excited to see the next iterations!